She didn’t. 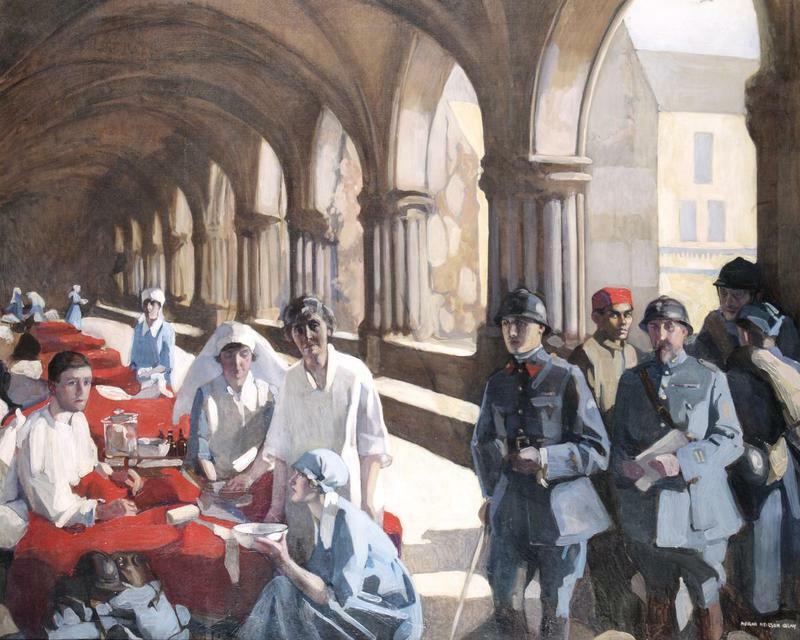 The first SWHU unit was despatched in December 1914 under the command of Liverpool surgeon Miss Frances Ivens to Royaumont, an ancient abbey north of Paris which operated under the auspices of the French Red Cross. Most of the filming appears to have been done at its field hospital, Villers Cotterets, closer to the front in December 1917 – hence the snow. It seems safe enough in the film….. but weeks later it was evacuated in the wake of a German advance and subjected to bombardment. The fur-coated ambulance driver, cooks and nurses serving dinner are clearly self-conscious in front of the camera. 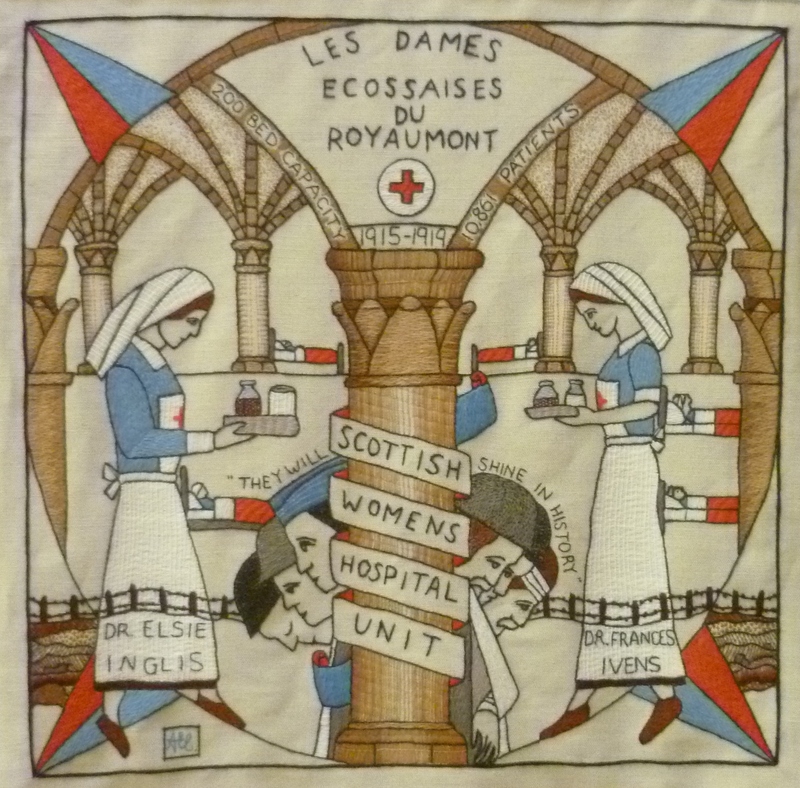 The Scottish Women’s Hospitals depended on an extensive network of fundraising, much coming from the National Union of Women’s Suffrage Societies (NUWSS) whose London units provided the x-ray van. Newnham and Girton colleges in Cambridge provided both money and volunteers as did women in the USA and around the world. The film itself may have been part of that fund-raising effort. The Scottish Screen Archive notes the NUWSS as the sponsor. But it could also have been an exercise by the British War Office’s propaganda division, an explanation favoured by Eileen Crofton, in her definitive work The Women of Royaumont (Tuckwell Press, 1997). That division was then under the command of John Buchan, the Scottish author and later politician who would have known the subject area well. Elsie Inglis rarely visited Royaumont – she was far too busy establishing hospitals elsewhere, including Salonika, where the SSA record says some of the film was shot. If so, she may actually appear in the operating theatre scene and/or in the line up of staff in the final frames (the woman seated on the far right has some resemblance). Elsie certainly could not have been at Royaumont for filming in December 1917 – she had died the previous month. Eileen was a meticulous historian and she records a letter from hospital orderly Evelyn Proctor to her mother about the film: “We had to fake all sorts of things, including an ‘op’ – it was too funny – I had to go out in the middle to produce a ‘foreign body’ which consisted of a piece of coal.” When Miss Ivens saw the film, she said it “made her blood run cold” and the unit’s unanimous opinion when they were shown the film after the war at one of their reunions was “atrocious.” So what we might regard as authentic now – was viewed in an entirely different light then. It’s an instructive lesson about film as a digital history source. Recent research by Imperial War Museum film archivists suggests that the film was actually made by the French Army’s film unit. This is confirmed by a clip in the French Defence Ministry archives. It is a much clearer print (although shorter) which you can watch here. 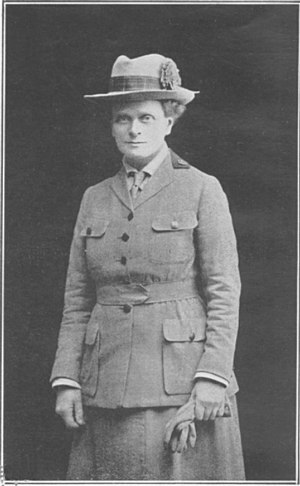 Through Elsie Inglis, the work of the SWH attracted much attention. Less well known are the achievements of the women’s hospital at Endell Street in Covent Garden, London. It treated far more casualties than SWH and was formally integrated into the British Army’s official war hospital network. Endell Street was all-female but more overtly suffragist in its approach than Royaumont. It was run by Flora Murray, a former colleague of Inglis, and Louisa Garrett Anderson. There is an excellent account of its work by Jennian Geddes here. Curiously, like the SWU, it also had problems with outside observers portraying its work. 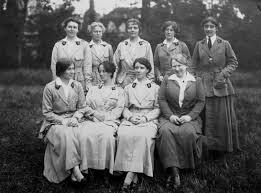 There is no doubting the courage, skill and perseverance of the women who served at Royaumont. They retained a strong sisterly bond for decades afterwards – and some were even back in France trying to set up a canteen ahead of the German invasion of 1940. 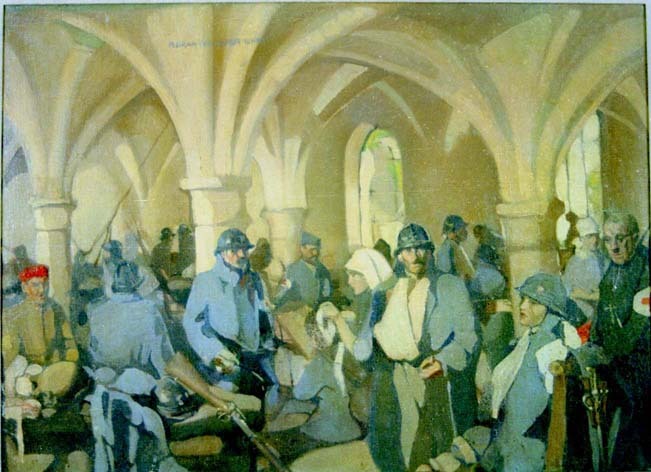 Royaumont was the largest continuously-operating voluntary hospital in France at the end of the First World War. Its mortality rates were better than its army-run equivalents. Miss Ivens was the first foreign-born woman to be awarded the Legion d’Honneur, France’s highest honour. No fewer than 30 of her Royaumont colleagues were awarded the Croix de Guerre, including sister Catherine O’Rorke, who had been arrested with Edith Cavell in Brussels in 1915. Nurse Cavell’s execution provoked an international outcry. More than 1000 women and a few men worked for the SWHU. If you think a relative might have been among them, there is a full list here. And as for how Edinburgh still remembers Elsie Inglis and the Scottish women volunteers, don’t ask. I think their judgement would be that it is shoddy and disgraceful. New photographs have also emerged of the women of Royaumont, thanks to the ever-resourceful Sue Light on her excellent blog. Frances Ivens is clearly shown at the centre of both. Her life is well recounted by Vicky Caren here and in this other post on the Merseyside at War site. Royaumont and other SWHU units are also covered in the Hopitaux Militaires de la Guerre 1914-1918 website. Read an interesting post from Francois Olier here. And there is a very perceptive piece on Royaumont by MF Weiner published by the Royal College of Physicians of Edinburgh which also holds a lot of archive material on the hospital and the women who served there. 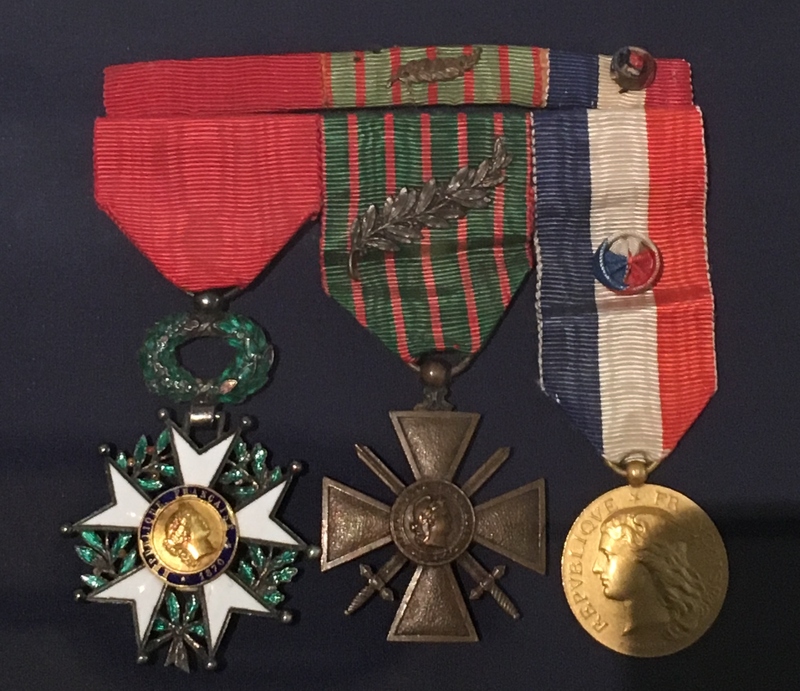 If you think you had relative who served at Royaumont, there is an excellent IWM site listing them all and seeking further information. Update (December 2018): The women of Royaumont held reunions – until 1973! Their newsletters, collected by Eileen Crofton, make fascinating reading here. There is also an exhibition (runs till March 2019) at Surgeons’ Hall – and a good blog here. Hi, a most interesting article. I am trying to track down some information on nurse Catherine O’Rorke and I was wondering if you would have any sources for her? But beyond that I don’t know. Well remembered in Kentucky but no real trace of her in Ireland or the UK. Thanks a million for your prompt response. I noted her entries thanks to the link included in the article above. She is often referred to as the nurse arrested with Nurse Cavell, although in the books I’ve read on the subject the more senior Nurse Wilkins is generally referenced. The reason I am seeking information on Nurse O’Rorke is that there may be a link to a town in my county called Ballymahon, and the Shuldham family, prominent landowners who developed the town. Any information on her and a possible link with Lt. MD O’Rorke of the Connaught Rangers, who was seemingly in the guard of honour on the return of Ms. Cavell’s remains to England, would be greatly appreciated. For Lt O’Rorke – there are good online searches now for WW1 service records. I have just finished readinh an amazing book entitled In Falling Snow by Mary-Rose MacColl, which is a work of fiction, but gives credence to the dedicated and tremendously hard work of the nurses and doctors , drivers and other workers at Royaumont during the first World War. I think there were a few Anzac nurses at Royaumont..
Johanna – I’ve just “Googled” this wonderful website and am poring over it all. I’ve also just finished reading this novel by Aussie Mary-Rose MacColl and I just LOVED it. Totally fascinating, informative and spell-binding and beautiful. What a bunch of women – they take one’s breath away. It’s a book I would love to give as a gift to a good friend. Our Library and Archive have launched a new digital collections website. 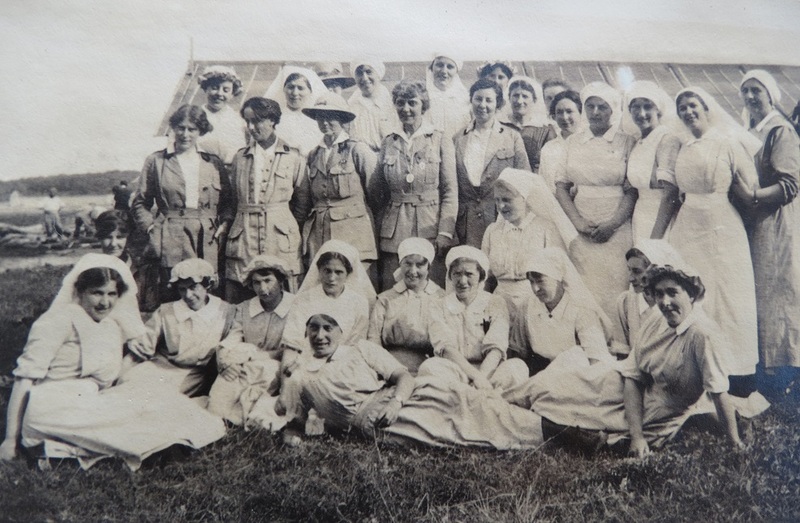 You are able to view a large photographic collection from the Scottish Women’s Hospitals featuring images from Royaumont which may be of interest to some of you.